GBPUSD has been fluctuating within the yellow area since yesterday and today the speeches from MPC members might bring some volatility to the market. 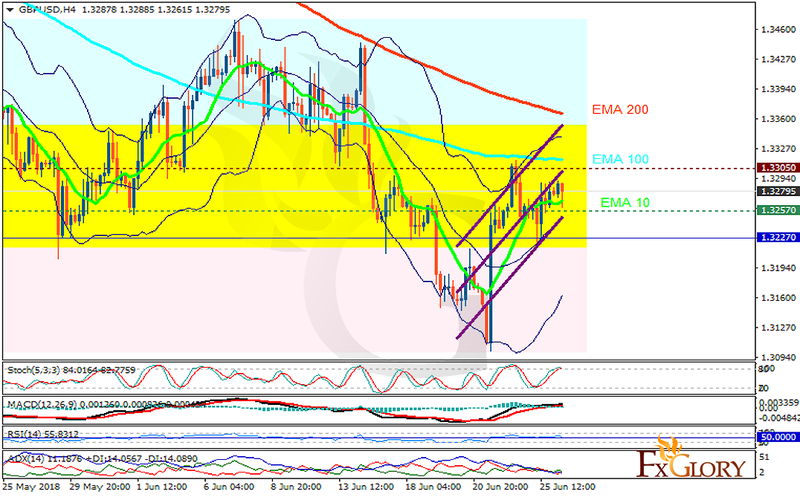 The support rests at 1.32570 with resistance at 1.33050 which both lines are above the weekly pivot point at 1.32270. The EMA of 10 is moving with bullish bias in the ascendant channel and it is below the EMA of 200 and the EMA of 100. The RSI is falling towards the 50 level, the Stochastic is moving in high ranges and MACD line is above the signal line in the positive territory. The ADX is not showing any clear signals. Although there were no major reports in the UK to support GBP yesterday, the pair grew a little due to the US weakness and EUR strength. It seems that 1.32 will remain the floor of the market and the price may rise towards the upper Bollinger band at 1.333.